The Foreign Office has admitted deleting a Twitter post that claimed UK experts had "made clear" the nerve agent used in Salisbury was "produced in Russia". 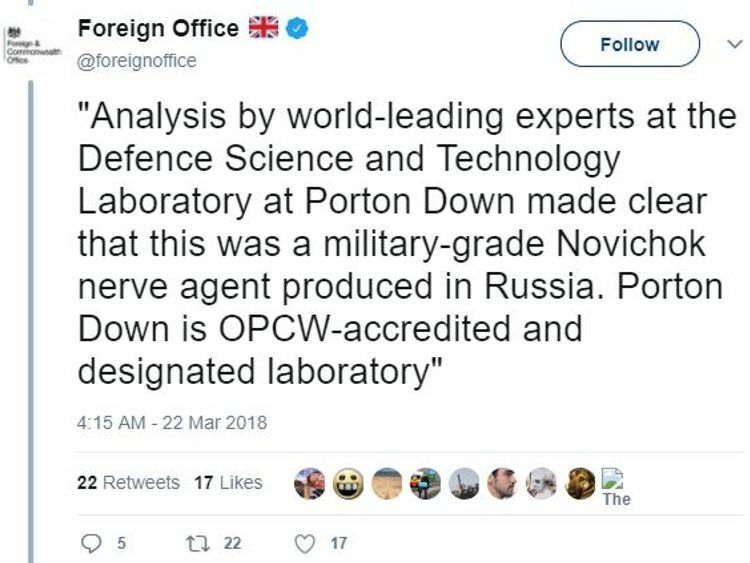 On 22 March, the Foreign Office's Twitter account claimed "analysis by world-leading experts at the Defence Science and Technology Laboratory at Porton Down made clear that this was a military-grade novichok nerve agent produced in Russia".The tweet added the Government's Porton Down facility is accredited with international watchdog the Organisation for the Prohibition of Chemical Weapons (OPCW) and a "designated laboratory". :: Four factors that led UK to blame Russia over spy attackAlthough a cached version of the Twitter post is still available on the internet, the original tweet has been deleted.It comes after the head of the Porton Down laboratory told Sky News on Tuesday they were not yet able to prove the nerve agent used to poison ex-spy Sergei Skripal and his daughter Yulia was made in Russia. The UK Government have blamed Moscow for the Salisbury attack, prompting an increasingly bitter diplomatic rift with the Kremlin.After it emerged on Wednesday that the tweet had been deleted, the Foreign Office said the post was removed because it "did not accurately report" the words of Laurie Bristow, the UK's ambassador to Russia, which the tweet was supposed to be quoting.However, the Russian government seized on the revelation of the tweet's deletion to restate its claim the Salisbury attack is being used to "vilify" Moscow.Russia's deputy foreign minister Sergei Ryabkov told the Interfax news agency: "Based on what was expressed before those reports and what is being voiced and published on social networks by official UK representatives after this report, I draw the conclusion that there are no illusions, they had designated the guilty party from the start and they will not give up this policy. "We will see the further development of this scenario in the near future contrary to logic, contrary to common sense, because totally different tasks are being set and all this case is being played out in order to completely vilify Russia geopolitically; this is an attempt to isolate Russia and so forth rather than to find out what really happened to Sergei Skripal and his daughter." 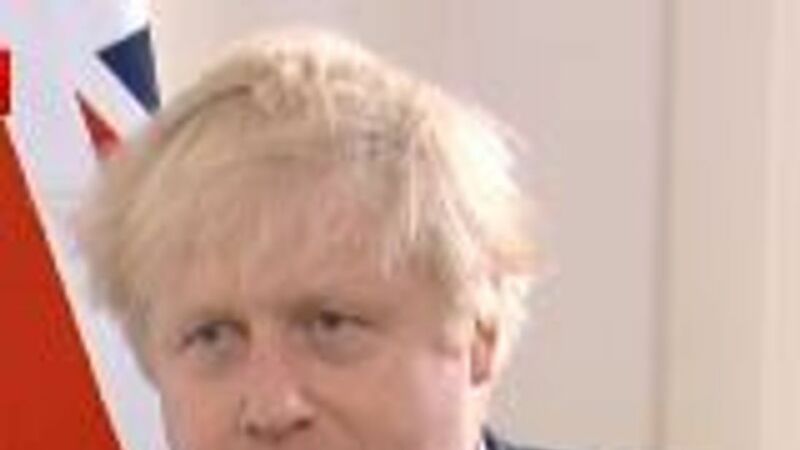 The Russian embassy in the UK also asked why the Foreign Office post had been removed.The now-deleted tweet was posted two days after Foreign Secretary Boris Johnson, in an interview with German broadcaster Deutsche Welle, claimed staff at Porton Down were "absolutely categorical" and told him there was "no doubt" the source of the nerve agent was Russia.The Foreign Office insisted Mr Johnson's comments and what Porton Down have said recently is "fully consistent" with UK Government's position throughout the fallout from the Salisbury attack. But Labour leader Jeremy Corbyn, who has been criticised for his own response to the Salisbury attack, told Mr Johnson he has "serious questions to answer".He said: "There clearly was a huge inconsistency in that the Foreign Secretary had made a statement, the Foreign Office put out a tweet in support of what he's said. "Porton Down then said they couldn't and wouldn't identify where it had come from, so they then deleted the tweet. "Where does that leave the Foreign Secretary? Egg on his face for the statement he made on German television." The Foreign Office highlighted how a full transcript of Dr Bristow's briefing to international diplomats on 22 March has been available online since the day it was delivered.They said the briefing was "tweeted in real time" by the UK embassy's Twitter account and had been "amplified" by the Foreign Office account to "explain what happened in Salisbury to as wide an audience as possible".A spokesperson said: "One of the tweets was truncated and did not accurately report our Ambassador's words. We have removed this tweet. "None of this changes the fact that it is our assessment that Russia was responsible for this brazen and reckless act and, as the international community agrees, there is no other plausible explanation. "No other country has a combination of the capability, the intent, and the motive to carry out such an act. 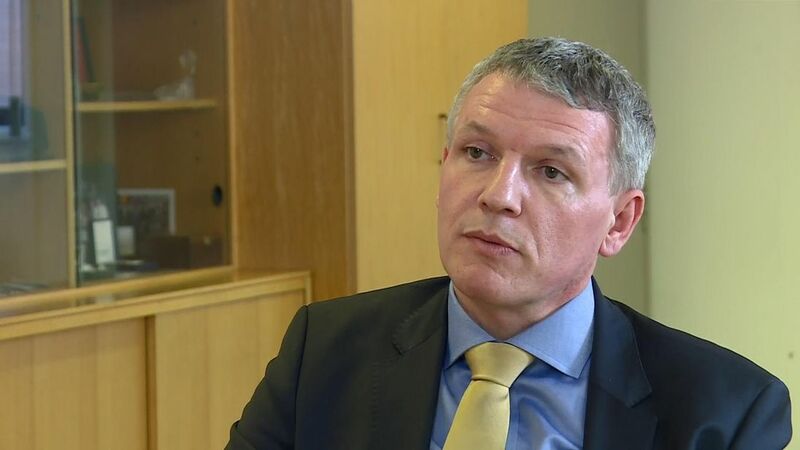 "The questions over the Foreign Office tweet came as discussions of the Salisbury poisoning at an extraordinary meeting of the OPCW further heightened tensions between London and the Kremlin.Ahmet Uzumcu, the director-general of the OPCW, used the meeting to announce he expects to receive the results of his organisation's own independent analysis of samples from Salisbury by early next week. Including analysis of biological samples from the Skripals and police officer Nick Bailey, who was also exposed to the nerve agent, the results will then be sent to the UK Government.Speaking on a visit to Turkey, Russian President Vladimir Putin said he is waiting for the moment when "common sense comes out victorious and international relations stop receiving the damage that we are witnessing right now".